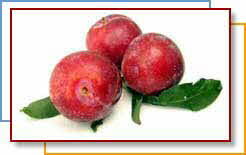 Plums are high in carbohydrates, low in fat and low in calories. Plums are free of sodium and cholesterol. Plums are a good source of vitamin C.
About twenty varieties dominate the commercial supply of plums and most are either Japanese or European varieties. Japanese are the nonprune plums or salicina plums. Originally from China, these plums were introduced into Japan more than 300 years ago. Most varieties have yellow or reddish flesh that is quite juicy and skin colors that range from crimson to black-red. They are also clingstone fruits—that is, their flesh clings to the pit. Santa Rosa and Red Beaut are two of the more popular varieties. Elephant heart is a large red-fleshed variety that is good for cooking. Plums are also used for their juice and often jam or a thick syrup is made out of it. European-type plums are smaller, denser and less juicy than Japanese varieties; their skin color is always blue or purple and their pits are usually freestone, meaning they separate easily from the flesh. The flesh is a golden yellow color. These are the plums made into prunes; a few varieties are sold fresh and called fresh prunes or purple plums. Among the better known varieties are Italian, President, Empress, Stanley, and Tragedy. Damson plums are a small-tart European-type variety used mainly for preserves. The domestic plum season extends from May through October, with Japanese types coming on the market first and peaking in August, followed by European varieties in the fall. Plums should be plump and well colored for their variety. Plums are usually about 3-6 cm in size. If a fruit yields to gentle pressure, it is ready to eat, however, you can buy plums that are fairly firm, but not rock hard and let them soften at home. They will not increase in sweetness. Ripe plums will be slightly soft at the stem and tip, but watch out for shriveled skin, mushy spots, or breaks in the skin. To soften hard plums, place several in a loosely closed paper bag and leave them at room temperature for a day or two; when softened, transfer them to the refrigerator. Ripe plums can be refrigerated for up to three days. Plums are juiciest at room temperature, but always wash them before eating or cooking. To pit freestone types, cut the fruit in half, twist the halves apart, and lift out the pit. To slice or quarter clingstone plums, use a sharp paring knife and cut through the flesh towards the pit. European plums are better than Japanese varieties for cooking. Cooked plums are usually eaten with the skins on, but if you need to peel them, first blanch them in boiling water for about 30 seconds. Baking: Place halved, pitted plums in a baking dish and sprinkle with sugar and spices to taste. Try adding a few spoonfuls of fruit juice, instead of water, and cover. Cook until tender, check during baking and add more liquid, if necessary. Cooking time: about 20 minutes in a 400 degree oven. Poaching: Plums can be cooked whole (prick them with a fork first), halved, or sliced. For serving whole, cook the fruit unpeeled to retain the shape. Place the fruit in simmering juice, wine, or a mixture of water and sugar and cook until tender. Cooking time: 3 to 8 minutes (European plums cook much faster than Japanese plums). • Chop plums into your next fruit salad to add a hint of purple. • Sliced plums add a unique flavor when added to grilled or broiled fish. • Add plums, along with your favorite fruits, as a topping for frozen yogurt. • Mix together chopped plums, blueberries, nectarines, and strawberries to spoon over waffles and pancakes for a colorful and nutritious addition to breakfast. Good to know: Plums stimulate the bowel movement. Its skin contains a substance that is responsible for that effect so if you peel the fruit you won't be bothered with the well-known side effects of this lovely fruit.